Despite an intense demand for industrial space in Los Angeles, not all industrial-zoned land becomes fodder for new construction. Often, other asset classes claim the higher and better use. A rare 2.2-acre industrial land site near Downtown Los Angeles traded hands to self-storage builder Westport Properties. 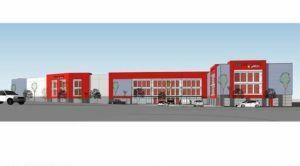 The firm plans to build a three-story 152,000-square-foot self-storage facility on the site, which was formerly occupied by a metal and plumbing business. “The seller operated a family-owned business, Angelus Sheet Metal and Plumbing Supply, out of this location for over 60 years,” Michael Collins, Vice Chairman at Daum Commercial Real Estate Services, tells GlobeSt.com. “Due to market conditions, the seller decided to close the business and take advantage of the high demand in the area by offering the site for sale.” Collins represented the seller in the transaction, along with Daum VPs James Vu and Ben Spinner.